Earlier, it was reported that a prototype Mi-28NM was deployed to the Hmeymim Airbase in Syria's Latakia province to conduct field testing in high temperature and desert conditions, and to test out a new mobile radar complex. A video purportedly showing the Mi-28NM gunship, operating in tandem with a Russian military Mi-24 in Syria's Hama province, has surfaced online. A second unverified video shows the pair of helicopters striking a ground target. 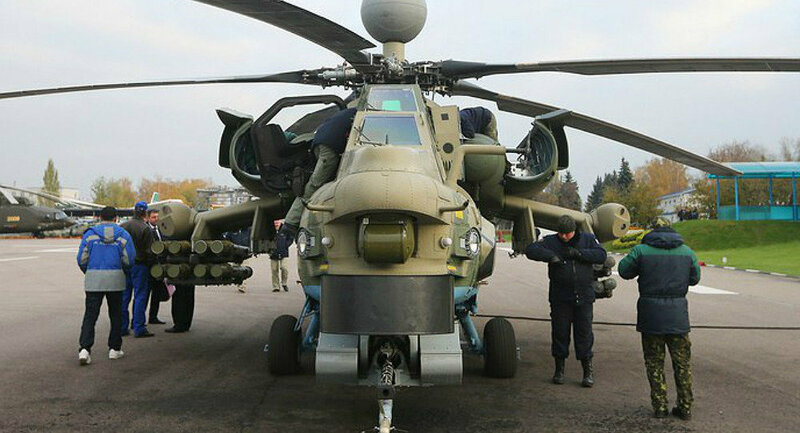 Dubbed the 'Super Night Hunter', the Mi-28NM was created after taking previously accumulated Syrian combat experience into account, and features improved engines, control and anti-air defence systems, fuselage, navigation and communications equipment, and specially created helmets with an augmented reality function to project map, intelligence and helicopter status information into the pilot and copilot's field of vision. The anti-armour helicopter is said to be capable of coordinating with autonomous drones, and can be armed with a new guided missile with a range of over 25 km. *Aka al-Qaeda in Syria, outlawed in Russia and many other countries.